Today I have my first attempt at Saran Wrap Nails. This mani has a big payoff for such little effort. It's all about the color combo with this technique and I love the results! 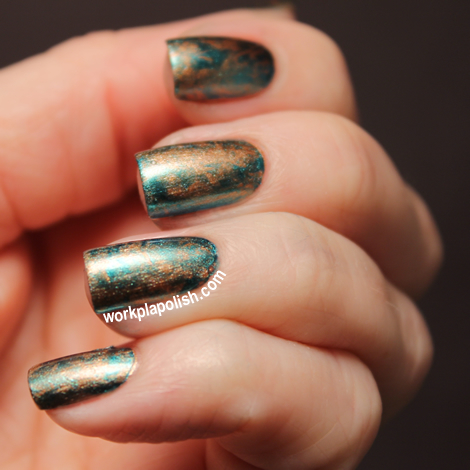 I started with two coats of Butter London The Old Bill, a burnished copper metallic. The Old Bill has a great formula and is simple to apply for being a metallic...no brush stroke complaints. I like the antique look of the color. It's different than a lot of bronze polishes that lean too yellow or orange. I added a coat of Seche Vite and waited until it was completely dry (this was the hardest part!). For the second step, I polished one coat of Deviantly Daring over one nail at a time...then dabbed the wet polish with a scrunched up piece of plastic wrap until I was happy with the results. 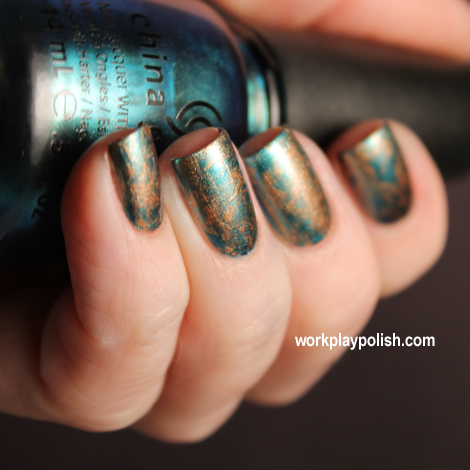 Deviantly Daring is from the China Glaze 2012 New Bohemian Collection. This is one of those polishes that's breathtaking in the bottle but not as breathtaking on the nail. Don't get me wrong...it's still a beautiful peacock teal color with a lot of depth and a great formula. But expectations are so high before you open the bottle, it's hard to live up to! However, I've found it's a great stamping and nail art color.